This page provides an overview of the history and theory of the Gestalt approach to counselling and psychotherapy. Gestalt as a therapy grew out of scientific Gestalt Psychology studies, primarily by Kurt Goldstein and Kurt Lewin, first in Germany and then in the U.S. in the 1930s, and morphed into a therapeutic approach in the U.S. in the 1940s and 1950s. The development into a therapy was due to pioneering work by Fritz Perls, Laura Perls and Paul Goodman, and other members of the humanistic schools of psychotherapeutic thinking that were emerging at that time. These thinkers were influenced by the psychoanalytic model of human behaviour as developed by Freud, and his discovery of the unconscious, but were also in reaction to his position that early childhood repressed conflicts were the sole determining factor in later dysfunctions, and that a therapist could “analyse” a patient and remain free from a relationship with that patient (i.e. that a therapist could be the so-called “blank slate”). As well as its German scientific influences, Gestalt was also influenced by Eastern philosophies such as Taoism and Zen. These philosophies emphasis change, as the only factor that is changeless. The sense of flow in Taoism (“The Watercourse Way”), of its natural, rhythmic cycles, connected strongly with the understandings coming to Fritz and Laura Perls, and Goodman. Gestalt psychology was also influenced from the beginning by the Western philosophical traditions, including Aristotle’s interest in natural processes (rather than Plato’s ideal forms), and later, Kant’s understanding of noumenon and phenomenon. Kant used noumenon to refer to something as it exists in the real world apart from any person’s experience of it, and he used phenomenon to refer to how that object is experienced by a person. For Kant, knowledge depends on experience. The theme of the experiential is still strong within current Gestalt therapy (as is phenomenology, as developed by the philosophers Brentano and then Husserl). Gestalt continues to absorb philosophical and scientific discoveries, including those from quantum physics, body-focussed research, adult attachment discoveries and neuropsychology. The Gestalt idea of the person as a naturally self-organising field fits well with recently rediscovered approaches to land use, farming and the natural world (“rediscovered” in that they were common knowledge to traditional cultures such as Australian Aboriginal peoples). Gestalt remains a holistic, experiential, person-focussed psychotherapy that is often best experienced rather then read about. From this standpoint, it’s not the analysis of the underlying elements that makes it possible to gain knowledge. Further and finer analysis not only fails to bring about an increase in knowledge but even makes it impossible! Rather, our consciousness forms units into wholes, into Gestalten. Awareness is central to the Gestalt approach. Gestalt is interested in an awareness of changes in the here-and-now, that is, in an awareness of the changes that occur in our experience from moment to moment, and what we make of these. The first step in any change process is an awareness of what is already there, what is missing, and what needs to change. Gestalt does not deny the importance of past and future, but is interested in how past and future present themselves now, and how we impact both ourselves and others by the changes we undergo from moment to moment. 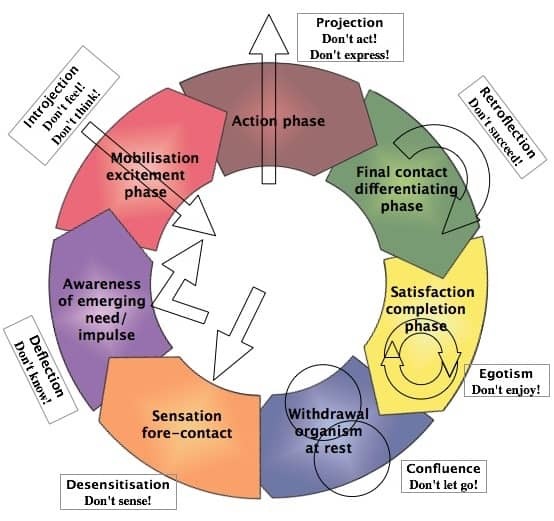 The Contact Cycle, also known as the Cycle of Awareness, is a useful model for describing how these moment-to-moment shifts occur. The cycle is depicted in several different forms, but here’s one of them. In Gestalt, contact between self and world is crucial. The boundary at which we make this contact is, not surprisingly, called the contact boundary. The diagram shows the way someone makes contact with the world. This cycle can apply to a relatively trivial event, such as drinking a glass of water, or to a momentous event such as recovering from a bereavement. The Cycle of Awareness shows the natural flow of events (in other words, aligning with the Tao). Things get interesting in reality when this doesn’t happen. The Gestalt model says that we may block our contact with the environment at each of these steps. Such blocking is usually out of awareness. Desensitisation. I don’t feel the sensation. I dissociate. Egotism. My self-absorption and self-consciousness prevent me from enjoying what I’ve done. A guiding factor in Gestalt therapeutic work is well summed up by Irvin Yalom in his book Love’s Executioner: It’s the relationship that heals. Gestalt has also been called the safe experiment, and this underlies the fact that the relationship between therapist and client is considered to be a safe container – a place where the client can investigate how they relate to someone (the therapist). This experiment can be the thing that raises the client’s awareness and highlights what’s happening when they relate to people in the outside world, and whether this is working for them. Gestalt is also called dialogic, in that the relating that occurs between therapist and client is given great importance and focus. What emerges in this dialogue, and the way the diauelog takes place, is seen as integral to the therapeutic process. The idea of polarities goes back to Taoism (yin and yang) and the idea that it’s impossible to know anything without a conception of its opposite (love/hate, rich/poor, cold/hot, wet/dry). Gestalt works with the continuum between any two poles, and our experience (or lack of experience) of our position on that continuum at a particular time and in a particular context. This experience is part of an awareness practice which is greatly facilitated in therapy. One important polarity in Gestalt is that of top dog/underdog. We can consider this polarity potentially playing out in relationships, as well as in two different parts of ourselves. Top dog is the controller, the one who says “I should…”. Underdog is the freer, more impulsive, laid-back one, the one who says “I want…”. In 1970 Arnold Beisser wrote a lovely short paper called The Paradoxical Theory of Change, on the notion that change only occurs once the current situation is fully accepted. Beisser wrote the paper out of his own experience of a once-athletic young man become totally paralysed. The theory says that once someone can truly experience where they are now, change can happen. By fully accepting who they are, there is then a chance for change. So rather than the therapist and client discussing how to change or what strategies may be needed, it may be more useful to explore together what is. An idea that arose from Gestalt psychology and perception is that of Figure – Ground. 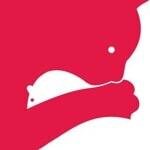 The image of the cat/mouse shown here depicts this idea. It’s a simple yet powerful idea that a perspective shift can happen suddenly, and Gestalt therapy picked up on this as a metaphor for what can happen in therapy. Sometimes we are only aware of the figure (what’s “figural”), have lost the ground in our busyness and fixed views. The therapist can attend to the possibility of the ground coming into awareness; of a perspective shift becoming available to the client in a way that is refreshing and exciting. The idea of the Field in Gestalt came originally from the thinking of Kurt Lewin, the social scientist. For Gestalt, it means that the person’s experiences are explored within the context of their social and cultural situation, their field. Lewin described the field as “the totality of coexisting facts which are conceived of as mutually interdependent”. He also called it the person’s lifespace. The field is a powerful metaphor for how we are always embedded within contexts. Yet it can be quite a challenge to change our normal thinking from individualism towards this view. We at Therapy Duo see this difficulty in our work with couples, where the meanings that drive behaviours are complex and sometimes deeply held. See our page on Staemmler’s Meanings and Behaviours in couple relationships for more on this. The field as normally conceived of in Gestalt has a phenomenological basis, although attempts have been made to extend the idea to cover ideas from other domains, such as contemporary physics. Gestalt holds the idea of the safe experiment in high regard. Why not try out with a trusted therapist new ways of behaving and reacting before unleashing them on the world? And why not make ourselves available to an experiment that makes new data available to us? Gestalt always holds the experiential position, that is, it believes that any new and true awareness will come out of something experienced, rather than conceptualised. We can conceptualise later, but first there must be the experimental data. An example of Gestalt experiment is chair work, where the client moves between two or more chairs, and with the aid of the therapist experiences different sub-personalities and tendencies in each of those chairs. We bracket our assumptions and expectations about the client. We practice horizontalisation. In other words, we don’t make assumptions about what is important and what is not in what our client brings to us. It all is of equal, important, weight to be considered. Phenomenology leads further into existentialism and the idea that we potentially live inauthentic lives because we cannot stand the reality that we are ultimately alone in the world, and our meanings are only that – ours. Again, this is a big subject, central to the thought of many twentieth-century philosophers. Gestalt takes the view that symptoms or behaviours (that other modalities might describe as pathological or unhealthy) are in fact creative adjustments that the person has made to cope with difficult circumstances. If a person has been unable to make authentic contact with the field (which could be, say, their caregivers when they were a child), they will adjust to that situation of anxiety in a variety of (creative) ways. If situations such as these become habituated then we can see that the Contact Cycle (shown above) becomes interrupted, at one or more points. We can say that gestalts are not naturally completed (we are not in the flow of the Tao, to use other language), and we then speak of fixed gestalts. The work in therapy is to uncover how this is carried over into the present – how the client can learn to have authentic actions rather than rebellions. This is rich and exciting work, for both client and therapist, as the client learns to rediscover spontaneity in their contacts with the world (their field). Philip Brownell – Gestalt Therapy – A Guide to Contemporary Practice. Alfred J. Marrow – The Practical Theorist – Life & Work of Kurt Lewin. Dave Mann – Gestalt Therapy, 100 Key Points. Ansel L. Woldt, & ] Sarah M. Toman – Gestalt Therapy – History, Theory, Practice. Rosemarie Wulf – The Historical Roots of Gestalt Therapy Theory.